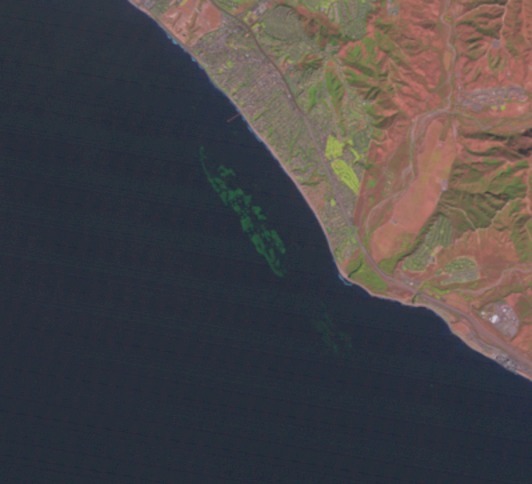 If you have been classifying images in California over the past few months, you may have come across an array of square kelp forests and wondered, “How did those get there? !” The story behind this amazing man-made kelp forest involves a nuclear power plant, a state agency, and some remarkable researchers. Artificial reef modules in the lower right corner! In the early 1970’s the San Onofre Nuclear Generating Station (SONGS) proposed adding two additional reactor units to increase its power generation capacity. The California Coastal Commission (CCC) granted the permit in 1974, but as a condition of the expansion a Marine Review Committee was established to direct impact assessment studies on nearby coastal ecosystems that could be negatively affected by the additional reactor units. As a result of these studies, the CCC added new conditions for the mitigation of identified impacts, one of the conditions was the construction of an artificial reef to replace kelp bed resources lost as a result of SONGS’ cooling water discharge. The additional reactors are cooled by a single pass seawater system. As the warm water is discharged back to the environment it is cooled with additional seawater using diffusers. 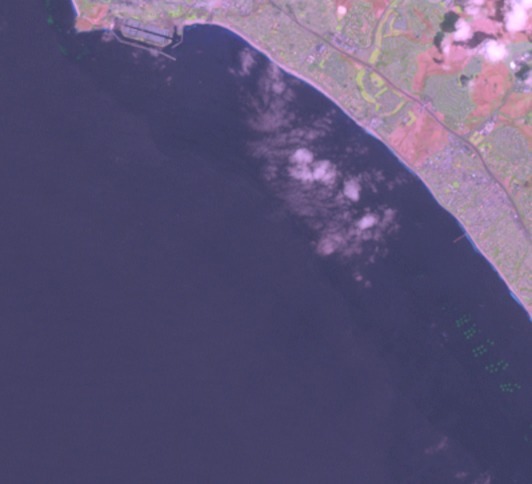 This process draws in ambient seawater at rate about 10x the discharge flow and is swept up along with sediments, which are transported offshore. This warm, sediment-laden plume led to substantial reductions in the abundance and density of kelp plants within the San Onofre kelp bed, as well as reductions in many kelp bed fish and invertebrate species. 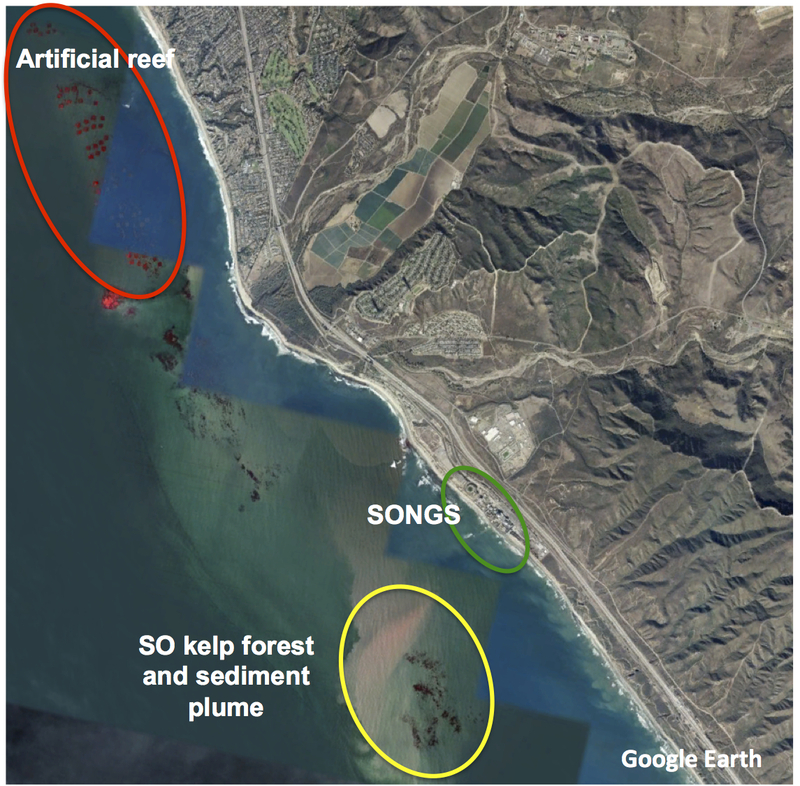 Locations of artificial reef modules, SONGS, and San Onofre kelp forest including sediment plume. 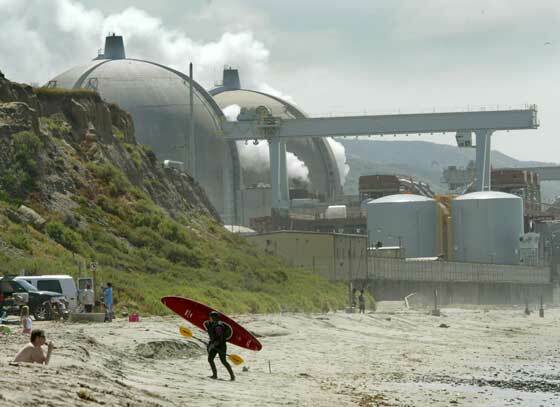 The mandated artificial reef had to be large enough to sustain 150 acres of kelp forest as compensation for the loss of 179 acres within the San Onofre kelp bed. This process began with a 5-year experimental phase that entailed building a smaller 22.4 acre reef to determine the substrate types and configurations that would support a giant kelp forest and associated biota during the later mitigation phase. The plan involved testing eight different reef designs that varied in substrate composition, substrate coverage, and the presence of transplanted kelp. Reef designs were implemented as 56 (40 m x 40 m) modules (7 replicates of the 8 designs), with construction completed in 1999. These are the squares seen on your images! Results obtained from monitoring the 5-year experiment showed a near-equally high tendency of all reef designs to meet the performance standards established for the mitigation phase, and the final recommendation was to build out the reef using low relief quarry rock or concrete rubble that covered between 42-86% of the bottom. Construction of the full artificial reef was completed in 2008 with the use of approximately 126,000 tons of boulder-sized quarry rocks, deposited into 18 polygons. When combined with the experimental reef, these areas provide 174.4 acres of hard substrate for the growth of giant kelp and associated species. 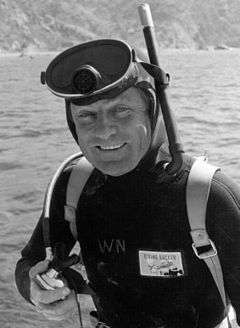 The reef was named after the late Dr. Wheeler North, a pioneer in the understanding of kelp forest ecology. The coastal development permit to operate SONGS requires ongoing monitoring of the artificial reef, which is led by UCSB researchers Dan Reed, Steve Schroeter, and Mark Page. These efforts evaluate whether the reef is meeting performance standards, and if necessary, determining why standards are not being met and recommending remedial measures. Artificial reef (mitigation reef + experimental modules) covered with giant kelp!!! Another amazing story behind the green blobs on your computer screen! For more information about the Wheeler North Reef click here! Estamos felices de anunciar que la pagina de Bosques Flotantes se encuentra en castellano (sigue con este enlace http://www.floatingforests.org/?lang=es). Las grandes macroalgas pardas o también llamadas “kelp” son especies que generan hábitat amparando a una de las comunidades mas diversas del planeta. Estas algas se distribuyen en todas las costas rocosas templadas. Presentes en casi todos los mares, estas especies varían en tamaño y forma donde algunos kelp como Macrocystis pyrifera pueden alcanzar los 30 metros de largo mientras otros solo alcanzan un metro de altura como aquellos encontrados en el Mediterráneo. En las costas del Pacifico en Mexico por ejemplo en las Islas San Benito, Baja California se encuentran unos de los bosques con mayor grado de conservación del Pacifico. Todas estas especies forman extensas praderas y pueden llegar mas allá de los 70 m de profundidad como el caso de Laminaria en las costas del Mediterráneo. El proyecto “Bosques Flotantes” alberga imágenes registradas por satélites (Landsat) desde los años 80 y nos permiten visualizar estos bosques, ¡desde el espacio! Pero el análisis de fotografías requiere de tiempo, y el proceso de identificación de imágenes es intensivo. Para solucionar este problema lanzamos el proyecto de ciencia ciudadana para que nos ayudes a participar en el análisis de imágenes. Hemos lanzado este proyecto en Australia y California donde ya llevamos mas de 1 millón de imágenes revisadas por diferentes usuarios de internet. Ahora con la traducción al castellano de esta plataforma en línea esperamos ampliar el rango de imágenes a las regiones donde ocurren estas plantas, empezaremos en Baja California (para que puedas ver estas praderas de las islas San Benito) y luego lanzaremos imágenes de las costas del Perú, recorriendo toda la costa Chilena, hasta el sur de Argentina. Este proyecto de ciencia ciudadana requiere de tu ayuda para poder avanzar mas rápido en la visualización y análisis de las costas templadas del planeta.